One of my favorite places in the world is within 12 Miles of Mountain Nature & Wild Bird Supply. It is Tallulah Gorge State Park in Tallulah Falls, Georgia. The cliffs of Tallulah Gorge are a spectactular 1,000 feet deep. You will surely see and read more about the gorge if you follow this blog. 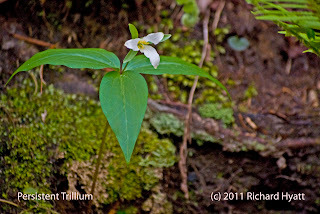 Here you will find the Persistent Trillium which grows only in and within 4 miles of Tallulah Gorge. Because it is so rare there are only a few places I know where the public can readily find them within the gorge. I am told there are other locations within the park where the Persistent Trillium may be found. This photo was taken April 8, 2011. I will be watching for the blooms early in 2012 because on other years I have missed seeing them. 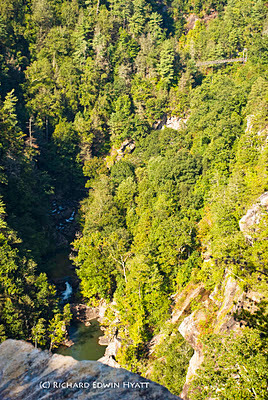 Here is a photo of part of Tallulah Gorge taken from Inspiration Point. The Tallulah River has 5 major waterfalls within its run through Tallulah Gorge. The hike to the bottom of the gorge shown here below the swinging bridge requires 1122 stair steps. This writer and his wife Jean have been know to do this hike three times in a week. We did it just two days ago and are likely to do it again tomorrow. I could write a lot about Tallulah Gorge and will likely do so often as I write this blog. Thanks for the comment. Yes, it is illegal to disturb, collect, etc., these rare Persistant Trilliums. I was even reluctant to post such a discription for the reasons you mentioned. Hopefully, comments like yours bring attention to the problem. Even when viewing wildflowers that are not so rare it is extremely important not to pick wildflowers. It is equally important to make sure to stay on the trail to protect this beauties for others to see.